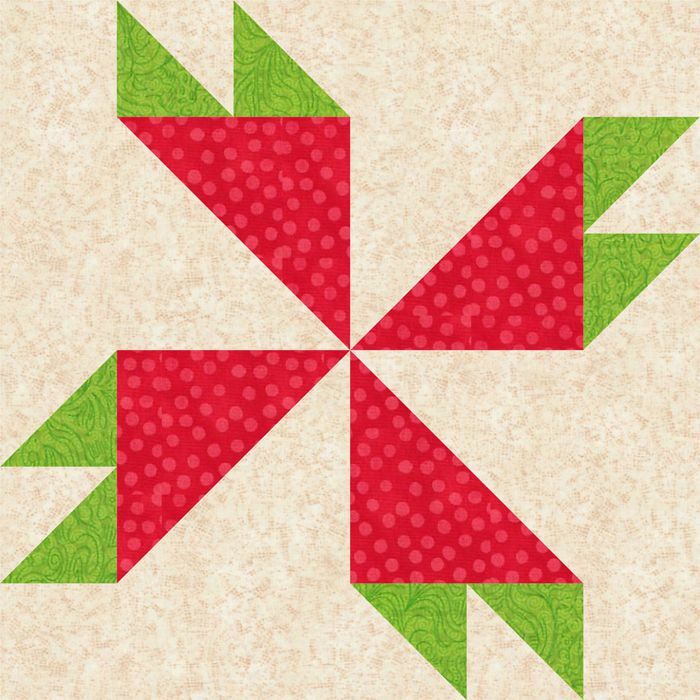 Try the Rosebud quilt block pattern to make quilt blocks that are similar to pinwheels blocks, but have extra patchwork to make the design appear more floral-like. The traditional Rosebud quilt block has been known by other names throughout the years so don't be surprised to see it listed in other ways. The Rosebud block is assembled with a combination of easy to cut and sew patchwork. Change colors in any way that suits you and don't hesitate to try the Rosebud design to make a scrap quilt. Use my easy quick piecing method to construct eight half-square triangle units from four 2-7/8" light squares and the four green squares of the same size. Each completed unit should measure 2-1/2" square. You could also use the Magic 8 half square triangle method to make eight identical units of the same size from two larger pieces of fabric. Refer to the illustration above as you assemble the quilt block. Use a calibrated quarter inch seam allowance to assemble the patchwork. Even though it's an extra step, we recommend you press to set seams before pressing allowances to one side. Cut all remaining squares in half once diagonally, from one corner to the opposite corner. Arrange a triangle cut by dividing a 2-7/8" light square alongside two green / white half-square triangle units as shown in the upper left corner of the illustration. Sew together to create a row. The sewn patches will be flush along the light tops. Press seam allowances towards the light triangles. Sew a triangle cut by dividing a 4-7/8" red square to the bottom edge of unit you created in Step 1, taking care to orient it as shown. Press the seam allowance towards the red triangle. Sew a triangle cut by dividing a 6-7/8" white square to the Step 2 unit as shown. Press the seam allowance towards the white triangle. The pieced unit should measure 6-1/2" x 6-1/2". Use the four Rosebud units to create two block rows as shown. Press the seam allowances between rosebuds towards the white triangle. Sew the two rows together to complete the quilt block. The quilt block should measure 12-1/2" x 12-1/2" square. If your block is smaller than it should be, or skewed along one side, press and recheck. If it still isn't quite right, use my easy squaring-up method before sewing it to other blocks.